Physical Description of the Holy Prophet Muhammad (SAW). To draw a pen-picture of his appearance is beyond one's capability, but the Sahabah (Radiallahu anhum) have endeavoured, according to their capabilities, to preserve what little they could, of which some is written here. Qurtubi says: "The full beauty and elegance of Sayyidina Rasulullah (Sallallahu alaihe wasallam) has not been made manifest, otherwise it would not have been possible for man to look at him". The Sahabah (Radiallahu anhum), have done the ummah an immense favour by conveying to them the perfect intrinsic knowledge, as well as the perfect conspicuous elegance and beauty of Sayyidina Rasullullah (Sallallahu alaihe wasallam). When an unfulfilled lover is deprived of meeting the beloved then he stands in front of the beloved's house remembering the features of his beloved, in an attempt to gain some solace. It is from habits and features that the heart is appeased. Anas (Radiallahu Anhu) reports: "Rasulullah (Sallallahu alaihe wasallam) was neither tall nor was he short (like a dwarf--He was of medium stature). In complexion, he was he was neither very white like lime, nor very dark, nor brown which results in darkness (he was illuminant, more luminous than even the full-moon on the 14th night). The hair of Rasullullah (Sallallahu alaihe wasallam) was neither very straight nor very curly (but slightly wavy). When he attained the age of forty, Allah the Almighty granted him nubuwwah (prophethood).He lived for ten years in Makkah (commentary) and in Madina for ten years. At that time there were not more than twenty white hair on his mubarak (blessed) head and beard." (This will be described in detail in the chapter on white hair of Rasulullah (Sallallahu alaihe wasallam). Sayyidina Rasullullah (Sallallahu alaihe wasallam) was of a medium stature, but slightly taller. This has been reported in a narration from Sayyidina Hind bin Abi Haalah (Radiallahu Anhu) and others. An objection may arise concerning these two hadeeth, that it is stated in one hadeeth that when Sayyidina Rasullullah (Sallallahu alaihe wasallam) used to stand up in a group, he appeared to be the tallest among them. This was not due to his hight, but was a result of a Mu'jizah (Miracle). In the manner that no one had reached a higher status than Sayyidina Rasullullah (Sallallahu alaihe wasallam) in `Kamalaate Ma'nawiyyah', (super intellectual status) likewise in the `Surah Zaahiri' (outward appearance) no one could excel him. "Most narrations show that Rasullullah (Sallallahu alaihe wasallam) lived for sixty three years." The ulama (scholars) have summed up these ahaadith in two ways. First, that Sayyidina Rasullullah (Sallallahu alaihe wasallam) received nubuwwah (prophethood) at the age of forty and risaalah three years thereafter, and after that he lived for ten years in Makkah Mukaraamah. According to this, the three years between nubuwwah and risaalah have been in the hadeeth under discussion. Anas bin Malik (Radiallhu Anhu) reports, "Rasullullah (Sallallahu alaihe wasallam) was of a medium stature, he was neither very tall nor very short. He was very handsome, of medium built and his hair was neither very curly nor very straight (but was slightly wavy). He had a wheat-coloured complexion. When he walked, he leaned forward slightly". In this hadeeth the word `Yata-kaf-fa-oo' is used regarding the walking of Sayyidina Rasullullah (Sallallahu alaihe wasallam). The scholars interpret this word in several ways. Some say it means to walk at a fast pace. Some are of the opinion that it means to lean a bit forward while walking. Some say it means to lift the leg with force. All three explanations are correct because the walk of Sayyidina Rasullullah (Sallallahu alaihe wasallam) fulfilled all three descriptions and the word also conveys these three meanings. Sayyidina Rasullullah (Sallallahu alaihe wasallam) walked quickly and not like the Romeos of this age who walk like women. It was also the noble habit of Sayyidina Rasullullah (Sallallahu alaihe wasallam) to walk with slight forward inclination of the head and shoulders. He did not walk with chest pushed out with pride. He lifted his legs as men do while walking and did not drag his legs on the ground. Baraa bin Aazib (Radiallahu anhu) relates that: "Rasullullah (Sallallahu alaihe wasallam) was a man of a medium build, (slightly tall, as explained before); he had broad shoulders (from which we may gather that he had a wide chest); he had dense hair which reached his ear-lobes; he wore a red striped lungi (a cloth worn around the legs) and shawl. I never saw anybody or anything more handsome than him". In this hadeeth the word `Rajulun Marbu'un' is used, which if the letter `Jeem' has a dammah (pesh), means a man. This could be correct. This type of word is used in the Arabic language for connecting words, but because no special quality or attribute is derived, some Muhadditheen (scholars of hadeeth) are of the opinion that if the letter `Jeem' has a fatah (zabar) on it, it means something that is between straight and bent. It may also be possible that in this case it refers to the description of the hair of Sayyidina Rasullullah (Sallallahu alaihe wasallam), and as described before, his mubarak (blessed) hair had a slight curl in it. From this hadeeth, some scholars are of the opinion that it is permissible for men to wear red coloured clothing. According to the Hanafis there is a detailed explanation on this subject. Before selecting red clothing, the scholars should be consulted regarding its permissibility. The scholars have written that in this hadeeth the Sahabi did not see `anything' more handsome and beautiful than Sayyidina Rasullullah (Sallallahu alaihe wasallam). This is said because besides human beings, the moon, sun, etc. are also included. Baraa bin Aazib (Radiallahu Anhu) reports: "I never seen someone with long hair and red clothing more handsome than Rasullullah (Sallallahu alaihe wasallam). His hair reached his shoulders. The portion between his two shoulders was wide. He was neither very tall nor very short". It is reported from Ali (Radiallahu Anhu): "Rasullullah (Sallallahu alaihe wasallam was neither very tall nor very short. The soles of both feet were very fleshed. (This quality is praiseworthy in a man as it denotes strength and courage but is not praiseworthy for a woman). He had a large head. The joints of the bones was also large. The was a thin line of hair from the chest to the navel. When Rasulullah (Sallallahu alaihe wasallam) walked, it appeared that he was descending from a high place". Ali (Radiallahu Anhu) says: "I did not see anyone like him neither before him, nor after him". The use of a sentence like: "I have not seen anyone like him", is primarily for emphasis. By describing Sayyidina Rasulullah (Sallallahu alaihe wasallam) in this manner, there is however no exaggeration because the complete beauty of appearance of Sayyidina Rasulullah (Sallallahu alaihe wasallam) cannot be fully described. Munaawi wrote that every person is required to believe that with whatever physical qualities and attributes of Sayyidina Rasulullah (Sallallahu alaihe wasallam) is described, no other person can compare with it. This is not merely a belief. Books on Seerah (History of the Prophet peace be upon him) and ahaadeeth are replete with descriptions of his beautiful qualities. Therein it is stated that Allah Ta'aala bestowed fully on the Prophet (peace be upon him) all the inner kamaalat (perfection) and Zaahiri (apparent) beauty. Two verses (couplets) are narrated from Sayyiditina Aa'ishah (Radiallahu Anha), the meaning of which is: "that if the friends of Zulaikha could see the blessed face of Rasulullah (Sallallahu alaihe wasallam), they would have cut their hearts instead of their hands". How true! If you wish to read more about the love of the Sahabah (Radiallahu Anhum---male and female---for Sayyidina Rasulullah (Sallallahu alaihe wasallam) read Chapter Eight of my book `Stories of the Sahabah' (Radiallahu Anhum). It is related from Ebrahim bin Muhammad (Radiallahu anhu) who is from the sons (grand sons of Ali radiallahu anhu, that whenever Ali radiallahu anhu described the nobel features of Rasulullah (Sallallahu alaihe wasallam), he used to say: "Rasulullah (Sallallahu alaihe wasallam) was neither very tall nor short, but of a medium stature among people. His hair was neither very curly nor very straight, but had a slight wave in it. He did not have a big body nor a round face, but his mubaarak face was slightly round (meaning he did not have a fully round face nor a fully elongated face, bur in between the two). The complexion of Rasulullah (Sallallahu alaihe wasallam) was white with redness in it. The mubaarak eyes of Rasulullah (Sallallahu alaihe wasallam) were extremely black. His eyelashes were long. The joints of the body (e.g. elbows and knees etc.) were large, likewise the portion between the two shoulders was broad and fully fleshed. There was no hair (more than normal) on his body. (Some people have profuse hair on their body. Sayyidina Rasulullah (Sallallahu alaihe wasallam) did not have hair on the parts of his body, besides places like the arms and legs etc.) He had a thin line of hair running from the chest to the navel. The hands and feet of Rasulullah (Sallallahu alaihe wasallam) were fully fleshed. When he walked, he lifted his legs with vigour, as if he were descending to a low-lying place. When he addressed a person he turned his whole body towards that person. (He did not only turn his face towards the person he addressed, as this is considered impolite, and sometimes, it even denotes pride. Sayyidina Rasulullah (Sallallahu alaihe wasallam) faced the person he spoke to, with his chest and body. Some scholars have translated this as, when Sayyidina Rasulullah (Sallallahu alaihe wasallam) addressed someone, he completely turned his face towards that person, and did not give a side glance. This is not a suitable translation). The seal of Prophethood was situated between his shoulders. He was a last of all prophets. He was the most generous and the most truthful. He was the most kind-hearted and came from a most noble family. (It means his character, family back-ground and everything else was of the best). Any person who saw him suddenly would become awe-inspired. Sayyidina Rasulullah (Sallallahu alaihe wasallam) had such a great personality and dignity, that the person who saw him for the first time, because of his awe-inspiring personality, would be overcome with a feeling of profound respect. Firstly, there is a ro`b (awe) for physical beauty, with this when other Kamaalat are added what more could then be said of the ro'b (awe). Besides, the special attributes and qualities granted to Sayyidina Rasulullah (Sallallahu alaihe wasallam) ro'b (awe) is also one of the special qualities granted to him). Anyone who came in close contact with him, and knew his excellent character was smitten with the love of his excellent attributes. Anyone who described his noble features can only say: "I have not seen anyone like Rasulullah (Sallallahu alaihe wasallam) neither before nor after him." Hasan bin Ali (Radiallahu anhu) reported: "I inquired from my maternal uncle (Sayyiditina Fatimah Radiallahu anha's step brother) Hind bin Abi Haalah (Radiallahu anhu) about the noble features of the Rasulullah (Sallallahu alaihe wasallam). He had often described the noble features of Rasulullah (Sallallahu alaihe wasallam) in detail. I felt that I should hear from him personally, some of the noble features of Raulullah (Sallallahu alalihe wasallam), so that I could make his discription a proof and testimony for myself and also memorise them, and, if possible, try to emulate and adopt them. (The age of Sayyidna Hasan (Radiallahu anhu) at the time of Rasulullah (Sallallahu alaihe wasallam)'s death was seven years. In view of his age he did not have the opportunity to realise fully the features of Rasulullah (Sallallahu alaihe wasallam). The uncle descirbed the noble features by saying: "He had great qualities and attributes in him, others also held him in high estemm. His mubarak face shone like the full moon. He was slightly taller than a man of middle height, but shorter than a tall person. His mubarak head was moderately large. His mubarak hair was slightly twisted. If his hair became parted naturally in the middle he left it so, otherwise he did not habitually make an effort to part his hair in the middle. (This is a more respected transaltion). A question may arise that Sayyidina Rasulullah (Sallallahu alaihe wasallam) habitually parted his hair as stated in Ahadith. The Ulama say that this was in the early periods where Rasulullah (Sallallahu alaihe wasallam) did not make an effort to do so. According to this humble servant, the answer to this is bit difficult, because it was the principal of Rasulullah (Sallallahu alaihe wasallam) to oppose the ways of the non- beleivers, and agree to the ways of Ahlul Kitab, he did not part his hair in the middle. For this reason, according to some Ulama, the bets translation will be that he only parted his hair in the middle if it could be easily done, and when this could not be done easily, and a comb etc. was needed to do it, then he did not part his hair in the middle. Occasionally he used to part his hair in the middle with a comb etc. When the hair of Rasulullah (Sallallalhu alaihe wasallallam) was abundant, it used to pass over his ear- lobes). Rasulullah (Sallallahu alaihe wasallam) had a very luminous complexion (colour), and a wide forehead. He had dense and fine hair on his eye brows. Both eye brows were seperate and did not meet each other in the middle. There was a vein between them that used to expand when he became angry. His nose was prominemt and had a nur and lustre on it. When one first looked at him, it seemed as if he had a large nose, but looking at it carefully showed that the lustre and beauty made it look large, otherwise in itself the nose was not large." "Here the gaze of the killer hasn't lifted modestly. There the hand of the lover rest on the heart of the deceased"
His modest habit was to look at something with a light eye,i.e. he looked at a thing, with modesty and bashfulness, hence he did not stare at anything. While walking he asked the Sahabah (Radiallahu anhum) to walk in front, and he himself walked behind. He made salaam to whomsoever he met"
Jaabir bin Samurah (Radiallahu anhu) says: "Rasulullah (Sallallahu alaihe wasallam) had a wide mouth. There were red lines in the whiteness of his eyes. He had little flesh on his heels." "These intoxicated eyes on which thousands of my kindred be sacrificed. That endless destroyer remains intoxicated day and night." It is related from Jaabir (Radiallahu anhu) that he said: " I once saw Rasulullah (Sallallahu alaihe wasallam) on the night of a full moon. On that night he wore red clothing. At times I looked at the full moon and at times at Rasulullah (Sallallahu alaihe wasallam) . Ultimately I came to the conclusion that Rasulullah (Sallallahu alaihe wasallam) was more handsome, beautiful and more radiant than the full moon." "If the illumination in the temple and sanctuary is through the sun and moon, so what. I desire you, what should I do with my sight." 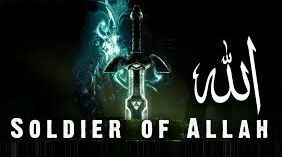 Abu-Ishaaq (Radiallahu anhu) says: "A person once asked Baraa bin Aazib (Radiallahu anhu), "Was the face of Rasulullah (Sallallahu alaihe wasallam) shining like a sword?" He replied: "No but like a full-moon with its roundness." An Arab poet says: "If you want to describe a shortcoming of a beloved, then give the beloved a similitude of a full moon. This is enough to insult him." Abu Hurayrah (Radiallahu anhu) says: "Rasulullah (Sallallahu alaihe wasallam) was so clean, clear, beautiful and handsome, as though his body was covered and moulded in silver. His hair was slightly curled." Jaabir bin Abdullah (Radiallahu anhu) narrates from Rasulullah (Sallallahu alaihe wasallam) that he said: "The Ambiyaa (Prophets) were shown to me. I saw Musa (Alaihis salaam), he had a thin body, like one from among the tribe of Shanu'ah. I saw Esa (Alaihis salaam). From among all those whom I have seen, he somewhat resembled Urwah bin Masud. I saw Ebrahim (Alaihis salaam). From among all those that I have seen,I, more or less, look like him. In the same manner I saw Jibra-eel (Alaihis salaam). From among all those I had seen, he more or less looked like Dihyah Kalbi." This was on the night of mi'raaj or in a dream. Imaam Bukhaari (Rahmatullahi alaihe) has narrated both, on the night of mi'raaj and also in a dream. There is no confusion or difficulty in these differences, because he may have seen them on both occasions. The translation of the description of Sayyidina Musa (Alaihis salaam) as having a light body, in my opinion, is made from more accurate sayings. Some Ulama in the translation of this sentence, have expressed other opinions. These three Ambiyaa (Prophets) were described because Sayyidina Musa (Alaihis salaam) and Sayyidina Esa (Alaihis salaam) are the nabis of the Bani Israel and Sayyidina Ebrahim (Alaihis salaam), besides being the great grandfather of Sayyidina Rsulullah (Sallallahu alaihe wasallam), was also accepted by all Arabs. Sa'eed Jariri (Radiallahu anhu) says: "I heard Abu Tufayl (Radiallahu anhu) say: "There is no one left on the face of this Earth, besides me who had seen Rasulullah (Sallallahu alaihe wasallam)." I asked him to describe to me the noble features of Rasulullah (Sallallahu alaihe wasallam). He said: "Rasulullah (Sallallahu alaihe wasallam) had a white complexion, which was slightly reddish, and had a medium sized body." Sayyidina Abu Tufayl (Radiallahu anhu) was the last one among the Sahabah (Radiallahu anhum) to pass away. He died in the year 110 Hijri. That is why he said, that there was no one left besides him who had seen Rasulullah (Sallallahu alaihe wasallam). The ulama say that he used the phrase `face of the earth' because Sayyidina Esa (Alaihis salaam) is also from the ones who had seen Sayyidina Rasulullah (Sallallahu alaihe wasallam), and is present in the skies (heavens). Ibn Abbas (Radiallahu anhu) says: "The front teeth of Rasulullah (Sallallahu alaihe wasallam) were a bit wide (spread out). They were spaced out and not close together. When Rasulullah (Sallallahu alaihe wasallam) talked, an illumination emitting from his teeth could be seen." Allahumma sali 'alaa Sayyidina Muhammadiw wa 'alaa aalihi biqadri husnihi wa jamaalihi. A text in which Ali (ra) describes the physical and moral beauty and the perfect behavior of the Prophet (saas), as well as the love and respect people feel for him. Your friend is only Allah and His Messenger and those who believe. He is Allah - there is no god but Him. He is the Knower of the Unseen and the Visible. He is the All-Merciful, the Most Merciful. Whoever obeys the Messenger has obeyed Allah, If anyone turns away, we did not send you to them as their keeper. Take a charity from their wealth to purify and cleanse them and pray for them. Your prayers bring relief to them. Allah is All-Hearing, All-Knowing. As we can discern from those who saw him in person, the Prophet (saas) was extraordinarily handsome, with a finely proportioned body and a face that took one's breath away. He also had a very athletic and powerful build. "The blessed one had a beautiful appearance, his limbs were in perfect proportion, his body was well-formed, his forehead and chest and the distance between his shoulders were broad. His neck was slender and pure as silver, his shoulders, biceps and calves were large and thick, his wrists were long, his fingers also long, and his hands and fingers rather thick. His blessed skin was softer than silk. On his perfect countenance were a well-proportioned head, curved eyebrows, a long nose and an oval face. His eyelashes were long, his eyes black and beautiful, the space between his largish eyebrows was clear, though his eyebrows were close together. His senses were exceedingly powerful. He could hear from a long way off and see further than anyone. In essence, he had a body formed in perfection and uniqueness, and blessed ... Anyone suddenly seeing him would be consumed with love, and anyone speaking with him would feel great love in his heart and soul. The wise respected him in accordance with their degree. He greatly honoured his relatives. He would not, however, treat them better than those more worthy than them. He treated his servants well. Whatever he wore or ate, he would give to them to wear and eat. He was generous, beneficial, compassionate, forgiving, brave and mild. In speech, he kept to his word. In essence, his excellent morality, sharp powers of reasoning were greater than those of all other people and worthy of great praise. Another text in which Ali (ra) describes the Prophet's superior morality, his astonishing beauty and the perfection of his behavior. Allah favored the Prophet Muhammad (saas) over all beings, and declared him to be "the Final Seal of the Prophets." (Surat al-Ahzab: 40) No prophet would be sent after him, and the Qur'an would be the last revelation to guide people onto the true way. Allah manifested that unique feature of the Prophet (saas) with a mark on his body. So believe in Allah and His Messenger and in the Light We have sent down. Allah is aware of what you do. There are different descriptions of the length of the Prophet (saas)'s hair. It is natural that there should be discrepancies between them, as the people these accounts have come down from saw him at different times, when his hair may have been of different lengths. Yet, what can be recognized from these descriptions was that the Prophet (saas)'s hair was at ear-level at its shortest and at shoulder-length at its longest. Know that the Messenger of Allah is among you. If he were to obey you in many things, you would suffer for it. However, Allah has given you love of faith and made it pleasing to your hearts, and has made disbelief, deviance and disobedience hateful to you. People such as these are rightly guided. The seal of the Prophet (saas) is available in the Topkapi Palace. When the Prophet (saas) wanted to write to the leaders of foreign states, he ordered a seal-ring to be made. when he has been called to Islam? The Mosque of Sultan Hassan (right) by David Roberts. ... they will have Gardens with rivers flowing under them. When they are given fruit there as provision, they will say, 'This is what we were given before.' But they were only given a simulation of it. Still-life painting by Ibrahim Safi. What is the Garden promised to those who have done their duty like? It has rivers flowing under it and its foodstuffs and cool shade never fail. That is the final fate of those who have done their duty. But the final fate of the disbelievers is the Fire. "The Holy Prophet (saas) was the most patient among men, the bravest, the best judge, and he who pardoned most. ... he was the most charitable man. He did not pass a single night hoarding a single dirham or dinar. Whenever any excess money came to him and if he did not then get anyone to accept it as charity, he did not return home till he gave it to the poor and the needy. He did not store up for more than a year the provision of his family members which Allah was pleased to give him. He used to take one fifth of what easily came to him out of dates and wheat. What remained in excess, he used to give in charity. He used to give away in charity to him who begged of him of anything, even out of his stored up provision. He did not take any revenge for personal wrongs but he used take it for preservation of the honor of Allah. He used to speak the truth even though it was sometimes a cause of trouble to himself and his companions. He was the most modest, without pride, and his tongue was most eloquent without prolongation of speech. His constitution was the most beatiful. No worldly duties could keep him busy. He used to go even to a distant place to see the sick, loved scents and hated a stench or bad smell, sat with the poor and the destitute, ate with them, honored those possessing honor, advised them to do good and show kindness to relatives. He did not treat harshly to anybody and accepted excuses offered to him. For this We sent a Messenger to you from among you to recite Our Signs to you and purify you and teach you the Book and Wisdom and teach you things you did not know before. Hind bin Abi Haalah described prophet Muhammad saying, "He had great qualities and attributes in him, others also held him in high estemm. His blessed face shone like the full moon. He was slightly taller than a man of middle height, but shorter than a tall person. His head was moderately large. He had a wide forehead. He had dense and fine hair on his eye brows. Both eye brows were seperate and did not meet each other in the middle. There was a vein between them that used to expand when he became angry. His nose was prominent and had a luster on it. When one first looked at him, it seemed as if he had a large nose, but looking at it carefully showed that the luster and beauty made it look large, otherwise in itself the nose was not large. His beard was full and dense. The pupil of his eye was black. His cheeks were full and full of flesh. His mouth was moderately wide. His teeth were thin and bright. The front teeth had a slight space between them. There was a thin line of hair from the chest to the navel. His neck was beautiful and thin, like the neck of a statue shaved clean, the colour of which was clear, shining and beautiful like silver. All the parts of his body were of moderate size, and fully fleshed. His body was proportionately jointed. His chest and stomach were in line, but his chest was broad and wide. The space between his shoulders was wide. The bones of his joints were strong and large (denoting strength). His forearm was long and palms were wide and fleshed. His both feet were fully fleshed. The fingers and toes were moderately long. The soles of his feet were a bit deep. His feet were smooth, because of their cleanliness and smoothness the water did not remain there but flowed away quickly. When he walked, he lifted his legs with vigor, leaned slightly forward and placed his feet softly on the ground. He walked at a quick pace and took rather a long step. He did not take small steps. When he walked it seemed as if he was descending to a lower place. When he looked at something he turned his whole body towards it. He always looked down. His sight was focused more to the ground than towards the sky. His modest habit was to look at something with a light eye, i.e. he looked at a thing, with modesty and bashfulness, hence he did not stare at anything. While walking he asked his companions to walk in front, and he himself walked behind. He greeted whomsoever he met." The most graphic description of the Prophet was given by an old woman at whose house the Prophet stopped on his way from the cave of Thaur to Medina and her goats gave so much milk that the Prophet and his companions were fully satisfied and yet there was much left over. â€œThe Prophet (s) had a most handsome constitution. Some gave the smile of his beauty to that of the full moon,His nose was thin, His face was smooth,His beard was thick,His neck was the most beautiful,If the rays of the sun fell on his neck, it appeared like a cup of silver mixed with gold. The place between his shoulders was wide. The Messenger of Allah (SWT), was not excessively tall or short. He was not very pallid nor dark. He did not have curly hair or lank hair. Allah (SWT) commissioned him at the age of forty. He stayed in Mecca ten years and at Medina for ten years and Allah (SWT) the Mighty, the Majestic made him die when he was sixty. There were not twenty white hairs in his hair or beard, may Allah (SWT) bless him and grant him peace. â€œThe Prophet (s) was neither tall nor short. He was handsome. His hair was neither delicate nor curly. He was neither very white, nor very brown. â€œThe complexion of Rasulullah (s) was white with redness in it. The blessed eyes of Rasulullah (s) were extremely black. His eyelashes were long. â€œHe was innocently bright and had a broad countenance. His manners were fineâ€¦ He had black attractive eyesâ€¦ His hair glossy and black, inclined to curl, he wore long. His voice was very commanding. His head was well formed and set on a slender neck. His expression was pensive and contemplative, serene and sublime. The stranger was fascinated from the distance, but no sooner he became intimate with him, than this fascination was changed into attachment and respect. His expression was very sweet and distinct. His speech was well set and free from the use of superfluous words, as if it were rosary of beads. His stature was neither too high nor too small. He was singularly bright and fresh. â€¦ His neck was beautiful and thin, like the neck of a statue shaved clean, the color of which was clear, shining and beautiful like silver. All the parts of his body were of moderate size. His body was proportionately jointed. â€œHis forehead was wide and the place between his eyebrows was bright like pure silver and eye-balls were black tinged with reddish hue. The hairs of his eye lashes were profuse, When he smiled or laughed, they (his teeth) shone like lightning. His lip was most beautiful,His beard was thick,His neck was most beautiful, neither long, nor short. If the rays of the sun fell on his neck, it appeared like a cup of silver mixed with gold. His chest was broad. It was even like a mirror and white like the moon light,His shoulders were wide. His palms were softer than wool.